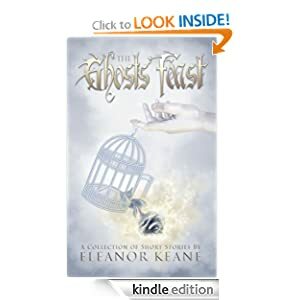 In The Ghosts’ Feast, the lives, loves and losses of some of the vampires within Eleanor Keane’s novel The Breathing Ghosts come to the fore: a young boy tries on his mother’s corset, a vampire servant becomes obsessed with her mistress, a lavish feast is laid out for the dead, and a dark goddess concocts deadly schemes. These short stories – amongst many others – travel from Ancient Pompeii, to 19th century Venice, to London in the Swinging Sixties, and all of them are woven together with ominous undercurrents of desire, death and vengeance. Who can we trust? Who can we believe in? This story collection came about because I wanted to expand on the stories of the vampire characters I created within my debut dark fantasy vampire novel, The Breathing Ghosts, as well as introduce some new characters- some of which will be also featured in my upcoming sequel. I wanted to delve more into the personalities, motives and ambitions of vampires and portray them as fully rounded individuals. I wanted to explore not just the monstrous side of vampires, but also their vulnerabilities as well. Actually, I prefer writing novels because it gives me greater scope and depth to explore my characters. However, writing The Ghosts’ Feast was a truly invaluable experience for me, and I loved writing in different styles and from varying view points! Without a doubt, Angela Carter- I love the dark undercurrent to her work, in particular The Bloody Chamber, which is a retelling of classic fairy tales with a subversive twist. I also love the short mystery stories of Dorothy L. Sayers and the short stories of Neil Gaiman (particularly those in Smoke and Mirrors,) as well as the short stories of J.R.R. Tolkien and J.K. Rowling- particularly as I love fantasy literature.